Humanistic Jews find in candle light a reflection of the human spirit. In lighting candles, we seek a connection with the past, with each other, and with ourselves. Candles, at their brightest, communicate strength, vitality, vision, and warmth. As they burn down to nothingness, they demonstrate the fragility of life. Humanistic candle blessings are blessings of peace and light in the world. They express comfort in the warmth of togetherness and connection, joy in the accomplishments of human beings, and a commitment to humanity. I think this sentiment is really how all denominations of Judaism look at the use of candles and fire, although they may phrase it slightly differently. Even if your practice embraces the notion of being “commanded” to light candles, there’s little that you need to change in the paragraph above. I like a little more G!d/dess in my religion than Secular Humanist Judaism offers, but here is a place where we can definitely agree. Chabad also has a beautiful article on the role of light and candles in Judaism. 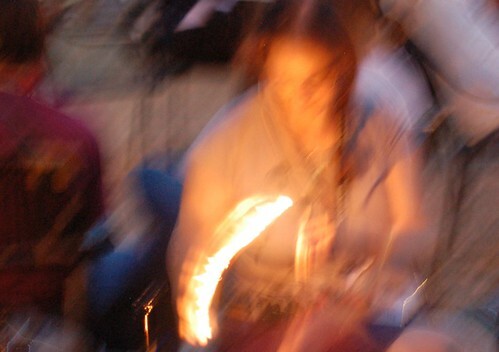 Lighting fires is a primal act, even in the controlled and dignified way we do it now. It just makes sense to light fires to mark important moments. In my practice candle lighting is also often the equivalent of “casting a circle” in other earth-based faith traditions. It is how I mark the change from secular to sacred space. The act is not only symbolic, but also transforming. The match is transformed, the wicks are transformed, the candles are transformed, the light I see is transformed, and candles even can transform the mood of a room. There are many amazing traditional practices around lighting candles. This month — try one. If you don’t regularly light Shabbat candles, then I recommend you start there. If you do light Shabbat candles, then try adding Havdalah to your practice. Don’t let the tradition of the braided candle be a barrier. If you can’t get one, use any candle. If you want to add the braid try carving it in or painting it (with fire-safe paint, please!). If you already do both of these, then take a look at this amazing article from Inner.org about flames and candles, and try apply some of these concepts to your Shabbat or Havdalah candle lighting. Another option is to try simple candle gazing meditation. Just find a quiet space and light a candle. Gaze at the candle and let your mind wander. Try not to let your focus leave the flame or the image of the flame blur. There’s some additional good meditation ideas in the Inner.org article. For those looking for something really different to try, explore the tradition of creating Soul Candles – which is traditionally done at Rosh Hashanah. One thing the author of that article doesn’t mention is that often women would go to the cemetery and wrap the wicks around gravestones as part of dedicating the candle to that person. I hope you’ll share your candle and fire related practices in the comments below or on Facebook with the growing community there! Pingback: Bibliomancy: Seeing Clearly in Tevet?